Visit Us | Tri-Mack Custom Plastics Manufacturing Co.
Tri-Mack’s main plant is located at 66 Tupelo Street in Bristol, Rhode Island. Adjacent to our main plant is our Advanced Composites Center at 65 Tupelo Street. All visitors should report to our main plant to sign in and receive a badge. Please do not wear loose clothing or open-toed shoes, as these are not allowed in our manufacturing facility. 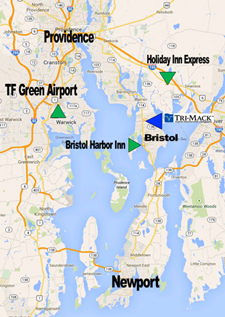 Tri-Mack is only a 30 minute drive from TF Green Airport (PVD) in Warwick, RI. TF Green is the low-hassle airport that offers convenient access to rental cars and I-95. 2.6 miles away in Bristol’s Downtown Historic District, Bristol Harbor Inn offers both boutique-style elegance on the harbor and a preferred rate to Tri-Mack guests. Water-view rooms are available and the sunset over the harbor is a must-see, with a variety of dining options within walking distance. Bristol is the perfect small-town setting for your visit to our facility, with the East Bay Bike Path and Colt State Park minutes away for recreational activities. 5.6 miles away in Swansea, MA, is Holiday Inn Express, offering an economical stay and a 15 minute commute into Bristol. This hotel offers easy access to I-195. If you need assistance, please do not hesitate to contact us! Rich in history and scenic beauty, waterfront restaurants and quaint gift shops, Bristol is home to America’s oldest 4th of July celebration, and is only 30 minutes south of Providence and 30 minutes North of Newport, R.I.